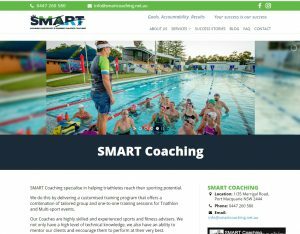 The Smart Coaching website provides a comprehensive overview of the training services they provide such as Personal Training, Pilates, Strength and Conditioning and Swimming. Read the success stories of people they have helped transformed their lives to be fitter, stronger and to achieve their goals. Ben and Belinda have participated in a high level of competition sport for most of their lives. They now help athletes achieve their sporting goals by sharing the knowledge, advice, guidance and support that they have accumulated between them over the years of training, competing and coaching. The website was developed by Golden Age Media who have developed hundreds of website for businesses in Port Macquarie, Taree, Forster on the Mid North Coast NSW. The website is mobile friendly and was developed with the latest technology and conforms to Google best practices. If you would like more information on the Smart Coaching website or website development, please contact Golden Age Media on 1300 766 713.